Could Sid the Sloth really play Koresh in 'Waco'? I haven't heard much from the semi-controversial Waco flick about the Branch Davidian raid lately. Now I see the cast has gotten very interesting: Adrien Brody as Steve Schneider, Kurt Russell as FBI guy Byron Sage (whom I actually met as a reporter prior to the Branch Davidian seige), Sharon Stone as Judy Schneider and John Leguizamo as, perhaps, could it be ... David Koresh? No confirmation on the last one but he could perhaps pull it off. 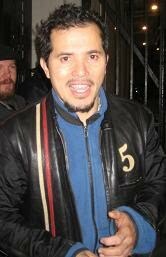 He is listed as in the cast without a role stated. Very interesting. Last I heard they were looking to make the film in Louisiana. Lone Star's Eloise Mumford (left) talks with fans at the pilot screening Saturday at The Studios at Las Colinas. 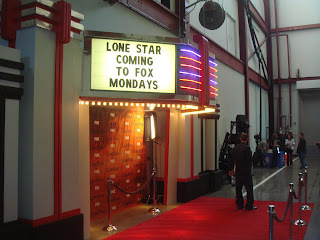 Here's the article about the sneak peek viewing of Fox's new Dallas-shot series Lone Star from today's Dallas Morning News. Eloise Mumford and Mark Deklin interviewed by FOX4's Clarice Tinsley. The red carpet at the Studios at Las Colinas. Mark Deklin knows which beer to drink. The desk of Jon Voight's grizzled oil man. Jon Voight's car ready for action. A select audience at the Studios at Las Colinas in Irving got a sneak peek at Fox series Lone Star on Saturday. 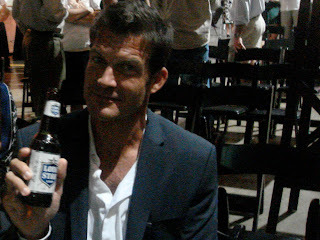 Nineteen Texas cities with Fox stations had events like this, with show creator Kyle Killen appearing in Austin. 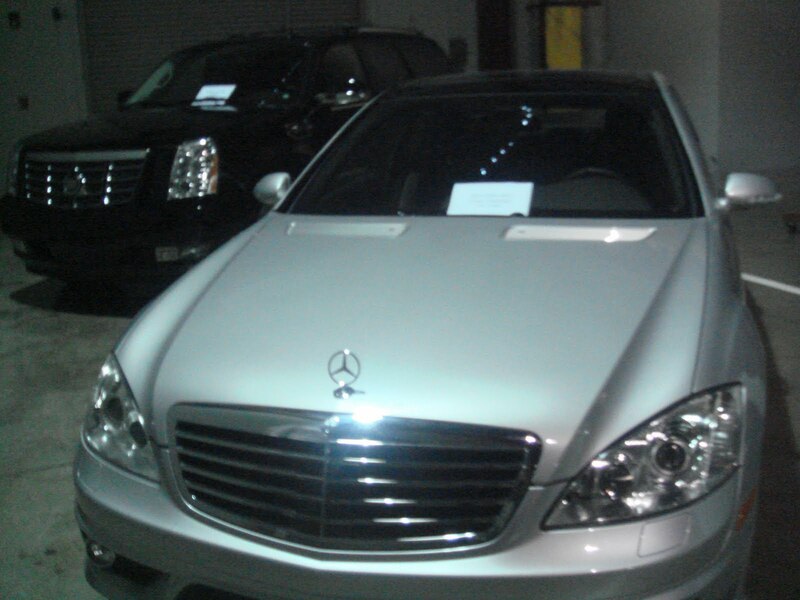 The Dallas-area event featured show actors Eloise Mumford and Mark Deklin. I also got a very quick look at the set (that's Jon Voight's desk), which is still being constructed. Look for report on the event in Monday's Dallas Morning News. Yes, I saw Slacker there. In high school we used to go to the midnight screenings of naughty films like Flesh Gordon and Ilsa, She Wolf of the SS. I saw Eraserhead there. My mother and I watched Babe together. My former students who worked there used to let me in for free. It was a frequent stop for Austin Film Festival and South By Southwest film screenings. I remember the television converted to a fish tank that dominated the lobby before the odd redesign that guaranteed everyone a bad seat. The place always seemed to be crawling with that special breed of nerdy college hipsters. It was Austin. This Sunday the four screens of the Dobie theater go black for the last time. Or is it? There is still hope that someone else will take over for the Landmark chain, which never seemed to get the Dobie. Perhaps it's a sign of the growth and change of the Austin film viewing scene. The Alamo Drafthouse changed everything. The Drag, which once was the epicenter of Austin film with the Dobie, Varsity, Texan and Texas Union theaters showing all of the cool arthouse fare, is now a filmic wasteland. But you can't help but wonder if it has to be that way. 4 Screens. Operated by Landmark since 1999. Located in the heart of "The Drag," the Dobie Theatre sits just off the University of Texas campus on the second floor of the Dobie Mall. The theatre has been a beloved Austin institution for well over twenty (?) years. Each of its four auditoriums have a unique theme-- Egyptian, French Tudor, Gargoyle Gothic and Space-Age Art Deco. 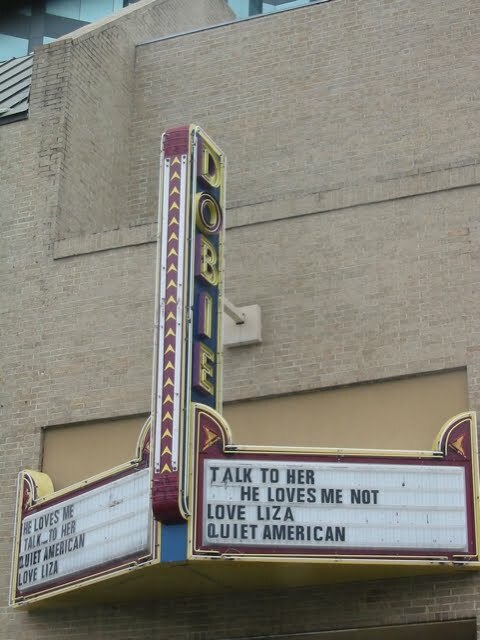 In the late 1980s and early 1990s, the Dobie became the epicenter for Austin's independent film community when a then unknown Richard Linklater walked in and asked if he could have some experimental 16mm films shown. This collection of film came to be known as Slacker. 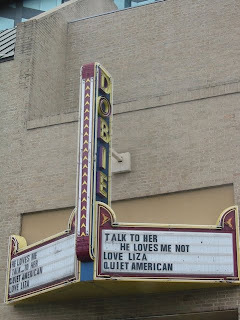 Later, when Linklater made his follow up film, Dazed and Confused, he insisted, much to the distributor's chagrin, that it be shown exclusively at the Dobie. It went on to play for over a year to sold out shows and posted the film's highest cumulative gross in the country. The Dobie also boasts a record-breaking, one year plus run of the local documentary favorite, Hands on a Hard Body. It's closing is a waste, but was known by former staffers to be coming for the last few years. Landmark obviously never understood the place or its history and potential. A Real Bookstore is indeed the name of the new place set to open in North Texas this fall. It's good news for writers and readers who bemoaned the loss of the Dallas area's major indie bookstore Legacy Books, which closes today. 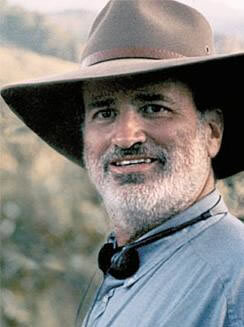 Malick's next film in Oklahoma? Reports are surfacing that Terrence Malick will shoot a "romantic drama" in Oklahoma starting in October, but he may already be shooting in Bartlesville, the town where he grew up (he went to high school in Austin). Thewrap.com sez Ben Affleck and Rachel Weisz have joined the cast, which is also said to include Christian Bale, Javier Bardem, Rachel McAdams and Olga Kurylenko (though Affleck may be replacing Bale in the picture). Affleck has been spotted in the area and talked about playing a fisherman. Talk of the film first began at the Berlin Film Festival in February. Just like the cloud of secrecy that surrounded Smithville-shot Tree of Life (no one would talk for the full year of rumors and casting), this one is getting the big denials in Okie-land. As for Tree of Life's future, it's as weirdly up in the air (no, don't look for it at the Toronto International Film Festival) as any Malick release, but word of the Oklahoma activity does hint that Malick is finally close to an end of tinkering with the very personal film. The folks at ThePlaylist.com have a nice rundown of a 2007 script of the film. Most of this has been covered in my blog, but here's my latest Dallas Morning News SHOT IN TEXAS column for your reading pleasure. Interesting news out of the Dallas TV series mecca: Andie MacDowell has joined the cast of Lone Star. MacDowell plays Alex, a 40ish-to-50ish art appraiser with an unpredictable streak who catches the eye of Clint Thatcher, Jon Voight's character. In reality, she will prove to be more dangerous than anyone realizes. Also just joining the cast is Rosa Blasi (Strong Medicine). Oh, and if you want to be an extra on the show, send an email to Kina Bale at lonestarextras@gmail.com. 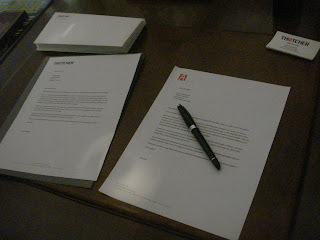 When filmmakers wants to officially announce a new project, they traditionally toss a press release to Variety or The Hollywood Reporter. 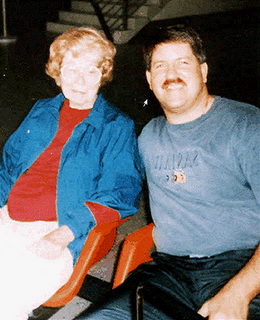 That's what Richard Linklater finally did in making official Bernie, his upcoming project about convicted murderer and small-town Carthage, Texas, dandy Bernie Tiede with Jack Black (a dead ringer for Tiede) in the lead role. As we told you back in June (with the first hints in April), Linklater has described this East Texas tale as his Fargo, with multiple characters and a bit of a murder mystery involving Tiede's odd relationship with the much older (and later much dead) Marjorie Nugent. What's the new info? It is indeed based on Skip Hollandsworth's Texas Monthly story, Shirley MacLaine will play Nugent and the whole thing will get going in East Texas (and partially in Austin, of course) in October. Townspeople – Linklater plans to hire Texans who are not necessarily professional actors. “I’m trying to make as authentic a portrayal of small town East Texas life as possible, so I’m looking for the real deal – funny and interesting folks. There are a lot of small parts in the movie, mostly for people over 40,” says Linklater. Please bring a non-returnable photo to get on file. It was open less that two years, but the largest independent bookstore in North Texas couldn't make it. Legacy Books in Plano will close later this month. Some blame the location. Others the prices. It's also no secret it's hard for an indie to thrive in the days of Amazon.com. Korean pro golfer K.J. Choi has joined the cast of Seven Days in Utopia, the feature film adaptation of Dr. David L. Cook’s best-selling book, Golf’s Sacred Journey: Seven Days at the Links of Utopia. Directed by Matthew Dean Russell, Seven Days in Utopia stars Lucas Black and Academy Award-winner Robert Duvall. Filming on location in Fredericksburg and Utopia, Texas, Seven Days in Utopia follows the story of Luke Chisolm (played by Lucas Black), a talented young golfer set on making the pro tour. When his first big shot turns out to be a very public disaster, Luke escapes the pressures of the game and finds himself unexpectedly stranded in Utopia, Texas, home to eccentric rancher Johnny Crawford (played by Robert Duvall). But Johnny’s more than meets the eye, and his profound ways of looking at life force Luke to question not only his past choices, but his direction for the future. The cast also includes Deborah Ann Woll (HBO’s True Blood), Brian Geraghty (The Hurt Locker) and Academy Award nominee Melissa Leo (Frozen River). The feature adaptation was written by Russell, Cook and Rob Levine. Since joining the PGA Tour in 2000, Choi has quickly gained notable success, finishing in the top 30 money winners in each of the last three years with over two million dollars in earnings in 2004. 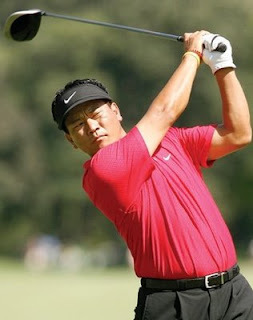 The first Korean born player to have secured a PGA card and won on the PGA tour, Choi is one of only two Asian born players with multiple wins on the PGA Tour and is only the fourth Asian born player with a PGA Tour victory. Seven Days in Utopia is being produced by Mark G. Mathis (Brick, Precious) and Jason M. Berman (The Dry Land). Executive Producers are Ken Herfurht, Phil Myers, Robert Carliner and Lucas Black. The film was cast by Mary Vernieu and Lindsay Graham.